Yuqin Zong works on the test chamber within which 480 LEDs are attached to the top of the sphere's interior. The monitor at left shows the image of the test units from a digital camera mounted at the bottom of the sphere. The light-emitting diode (LED) appears on track to become the light of our lives. Switching to bright, energy-efficient, durable, and environmentally friendly LED lighting systems over 20 years could save the nation an estimated $250 billion and reduce electricity consumption for lighting by half, according to the U.S. Department of Energy (DOE). NIST is helping to make that transition possible. For nearly 10 years, NIST researchers have worked with DOE, the American National Standards Institute (ANSI), the Illuminating Engineering Society (IES), and other organizations to devise performance standards and measurement methods for LEDs, to help define the requirements for product certification in DOE programs such as ENERGY STAR (now managed by the Environmental Protection Agency), and to determine the contents of DOE-mandated laboratory accreditation programs. In 2008, NIST took the lead in developing the world's first standard for solid-state lighting final products. But the field is evolving fast, and there are still many unanswered questions. One of them is: How long, exactly, are LEDs expected to operate before failure? There is no generally accepted answer, says Cameron Miller of the Optical Radiation Group in PML's Sensor Science Division. "The usual estimate is 50,000 to 100,000 hours, or somewhere in the neighborhood of five years. Of course, almost no one has ever measured an LED for that long. And those few measurements – taken in different ways by different groups – typically lacked uncertainty figures. But we still need some reliable method of projecting how long LEDs are going to last. So we're setting out to provide authoritative data in a fully controlled setting." In a few weeks, Miller and colleague Yuqin Zong will seal 480 3W white-light LEDs from four different manufacturers inside an integrating sphere to begin up to five years of fully automated continuous testing. Some will remain illuminated; some will be switched on and off. Each group will be operated at three different temperatures – 55 ͦC, 85 ͦC, and 115 ͦC – using three different heat-sink configurations. A spectrometer connected to the sphere will record the data. Periodically, it will measure each individual LED's light output. "The automation routine will turn them all off and then scan through the collection one at a time," Zong says, providing information about how luminance changes over time. A digital camera mounted at the bottom of the sphere will constantly monitor the entire array, providing a time-stamp marker when any LED fails. "The data coming out of this will be very helpful for models," Zong says. "Typically industry provides test data without uncertainties, so there's no objective idea how good the data are. As a result, LED performance has been hard to model. Moreover, the industry data are all from 'continuous burn,' which is not how LEDs are actually used." At the same time, the PML team has just completed work on the second generation of its solid-state lighting proficiency test kit, and is about to deploy the units, each the size of a medium piece of luggage, into the field. DOE's Energy Star program requires accreditation of laboratories that conduct the standard tests for solid-state lighting products, which includes measurement assurance and operator proficiency. 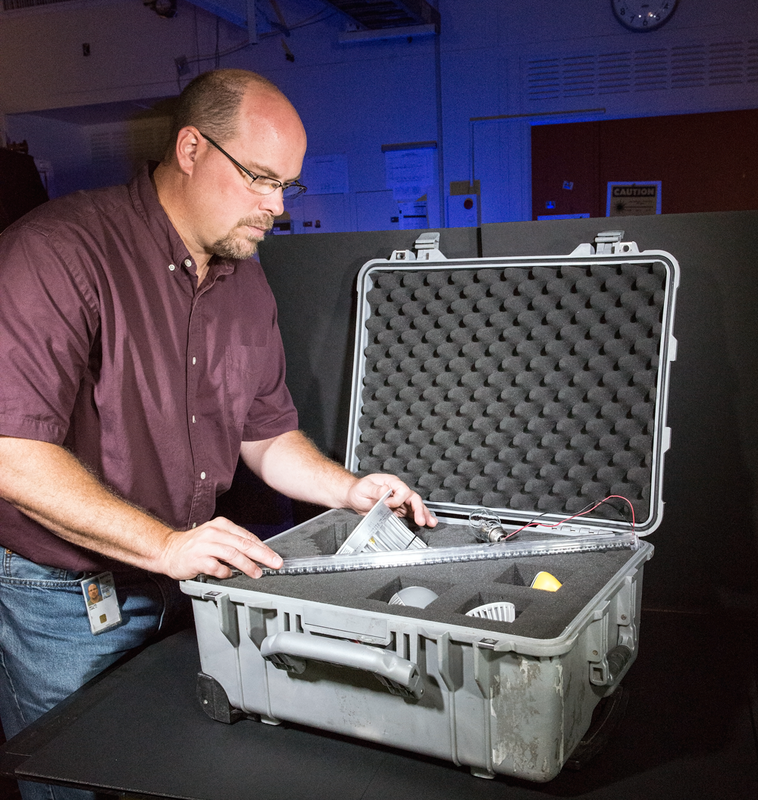 Cameron Miller demonstrates the set of proficiency test objects selected by NIST researchers. "We're trying to help those testing laboratories," Miller says. "About two years ago we started a measurement assurance program. We researched and characterized a number of LED products available on market, and then selected a set of six lamps – each chosen for distinctive properties and subtle differences from other units – that have become our proficiency test kit. "It provides both traceability to NIST and a means of direct comparison between different test laboratories. We work with the National Voluntary Laboratory Accreditation Program (NVLAP), and have branched out into other accrediting bodies. To date, we've worked with more than 90 laboratories, and we've gotten them to where they are within plus or minus 4 percent of each other. By comparison, it took several years for labs to get within 7 percent for compact fluorescent lamps."